One of our favorite and frequent stops in London was Harvey Nichols. 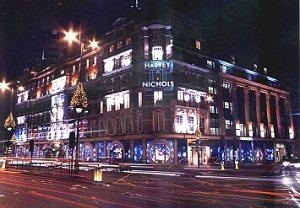 Often referred to as Harvey Nick's, this elegant store has been in business since the 1880's and is known for it's plethora of departments, all of which offer divine luxury goods. Harvey Nick's has a distinct style that is present in everything they do or present. We thoroughly enjoyed the many facets it has to offer. Stay tuned for more posts about Harvey Nick's!